Need Assistance? Call 1 (877) 852-3215. Built for Safety. Every detail of our Rubex electric powered stairlift is designed with your safety in mind. We build safety sensors into the footrest, include a locking mechanism in the seat belt, and give the motor instant reversing capability. 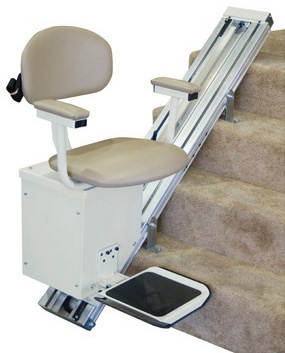 With automatic limits at each end of the track, standard mechanical and electrical slack cable safety devices, and a fail-safe mechanism that prevents operation until the seat is in the correct position, this stairlift is one of the safest on the market today. It is ETL listed and meets ASME A17.1 and A18 safety standards for public and private use. We also include call stations for both top and bottom landings, which can be mounted to the wall or to the floor. Read more about AmeriGlide stair lift safety standards. Easy "Homeowner" Installation. Unbelievably, the AmeriGlide Rubex electric powered stair lift simply plugs into the nearest outlet. No special wiring is needed! You can install it on either the right-hand or left-hand side of your staircase; you can even switch it from side to side without any additional parts. Sleek Design Compliments Any Decor. 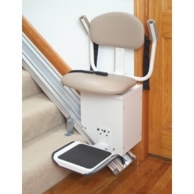 The AmeriGlide Rubex electric powered stair lift is available in an attractive almond finish with your choice of vinyl seat color. 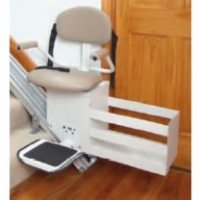 When not in use, you can easily fold up the padded seat and flip up the footrest and your stair lift only takes up 14 inches of space. It's so compact, other people in your household always have full use of the stairs. Questions? Contact one of our stair lift experts to find out more about how the Rubex electric powered stair lift fits your life. Note: weight capacity is reduced to 250 pounds if track length is 16 feet and longer. 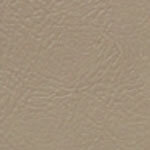 Unit Footprint, In Use: 24.25"
Frank from Niagara Falls Canada would recommend this to a friend. should of ordered the raising arm rests. 2 weeks to the front door. save some money do the customs and import work yourself. about an hour. Michelangelo from Long Island would recommend this to a friend. Everything works perfectly...we are very happy with our new stair lift. Service and delivery were on time.